Probably the hardest review to write in this space is an anthology of diverse works you aren't familiar with initially. Yet such collections can be quite rewarding. 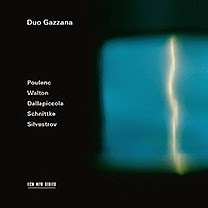 So I jump in today with the violin-piano Duo Gazzana and their recording of selected works by Poulenc/Walton/ Dallapiccola/Schnittke/Silvestrov (ECM New Series B0020437-02). The duo is made up of the sisters Natascia Gazzana (violin) and Rafaella Gazzana (piano). The Italy-born twosome formed the duo alliance in the mid-90s. This is their second album for ECM. I covered the first, Five Pieces, quite favorably in this space last November 21st, 2011. What these works have in common is a contemporary modern 20th-21st Century treatment of classical forms. The program begins with Alfred Schnittke (1938-1994) and his 1972 "Suite in the Old Style" which comes off well and shows Schnittke at his rooted yet inimitable best. There is a playful vivacity to the work, the charms of which are hard to resist. Valentin Silvestrov (b 1937) gives us an original take on neo-baroque in his 2009 "Hommage a J.S.B. ", a work with contrapuntal weight and a real sense of gravitas. We get more well-considered old-in-the-new music in Francis Poulenc's "Sonata for Violin and Piano" (1942/3 rev 1948), which builds elaborately upon toccata, suite, divertissement and variations forms for a present-era point of view that has Poulenc's patented forward-moving sense of kinetic energy. William Walton's "Toccata" (1922/23) is an early work that has a greatly expressive, rhapsodic flourish. Finally Luigi Dallapiccola chimes in with "Tartiana seconda" (1956), a modern contrapuntal workout inspired by Baroque master Tartini. This is a work of great memorability, handled with zest by the duo. A fitting end to a wide-ranging and continually absorbing program. These works call often for considerable interpretive and technical excellence. The youthful dash of Duo Gazzana give us plenty of both in a program of unity within great diversity. What seems at first a potpourri of varying modern period masters and their works comes together to give us a sort of survey of the ways tradition has not always been overturned in modern times but sometimes also has aided and forwarded the search for new sounds within expressive and structural models that date back centuries. Duo Gazzana brings us performances of vivid musicality. One could not ask for much better than this. They are virtually without peer for this kind of repertoire today. Molto bravo! I look forward to more. Encore!